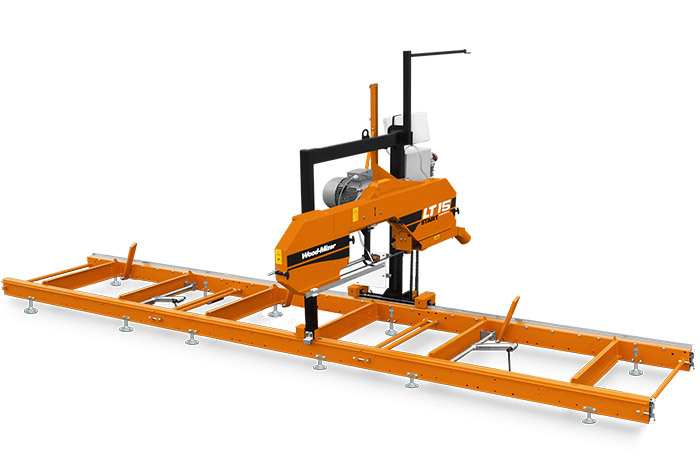 The LT15START is the ideal affordable sawmill for straightforward timber processing with sturdy construction and simple features. Woodworkers, farmers, furniture makers, and builders who want to save money by producing their own sawn timber from logs will find that the LT15START will exceed their expectations for an entry-level sawmill. The LT15START cuts logs up to 70 cm in diameter and 5.4 m long with the standard bed. In order to cut longer logs, bed extensions can be added to extend the sawmill bed to any required cutting length. The sawmill features push feed and a manual crank for repositioning the blade for the next cut. Thin-kerf blades require minimal energy consumption, so a 5.5 kW electric motor provides sufficient power to cut all wood types. A 14 HP petrol engine is also available on the LT15START. Logs are secured to the bed by the three standard log clamps and six adjustable backstops. The head height is precisely positioned by a hand crank and cutting is accomplished by steadily pushing the sawmill head along the length of the log with light pressure. Once the cut is completed, the head is raised, and then pulled back and lowered into position for the next cut. A water tank feeds lubrication directly to the blade to improve cutting performance and keep the blade clean. The adjustable blade guide arm keeps the blade well-supported while cutting various sized material. Blade tension is easily adjusted, and keeps the blade at the proper tension for cutting. Optional log loading ramps aid loading large logs with spring loaded brackets. Easily cut longer logs by adding additional bed extensions. Plenty of power for cutting and results in a low power bill. Easily adjusts for precise board thickness with the manual crank. Easy-to-operate system ensures correct blade tension. Secure logs and allow you to cut as low as 25 mm from the bed. By adding the MP100 moulding / planing head to the sawmill. For additional productivity, add the optional electric head up/down. Glen Chapman tells how one small sawmill in Congo has provided opportunity to improve lives in amazing ways.